Remember when I said the sweet red pepper sauce I made for the Patagonian Tooth Fish, was so delicious, that I could practically drink it? Starring Sweet Red Kapia Peppers from Melissa’s Produce, this soup is shockingly rich and creamy without cream! And your guests will assume you’ve spent hours to create such deep, full-bodied flavors — only you and I will know it only took you 35 minutes. This recipe is an incredibly delectable, lovely way to start the soup season. This is not a sponsored post. Melissa’s Produce sent me Sweet Red Kapia Peppers for recipe testing, and all opinions are my own. I only promote, create recipes with, and write about products I love. Coat the bottom of a medium-sized saucepot with the oil and place it over medium-low heat. Add the paprika, onions and garlic and cook until the onions are transluscent and soft, about 5 minutes. Add the peppers and sauté for a minute or so. Then add the tomatoes, 2 large basil leaves, and balsamic. Cook for about 4 minutes, just to soften and blend the ingredients. Add the water and bring to a boil. Then reduce the heat to low, cover the pot, and very gently simmer until the peppers are very tender, about 15 minutes. Use an immersion or standing blender to purée the soup until it's as smooth as possible. (For this recipe, I prefer to use a blender -- it tends to create a smoother consistency.) Pour the soup back into the pot and add the salt, sugar and a few turns of freshly ground black pepper. Drizzle each portion with a bit of extra virgin olive oil, if desired -- and top with a few small basil leaves. While I recommend Kapia peppers, this will still be a superb soup with another sweet red pepper. If you use a standing blender for hot liquids, you have to hold down the lid very, very firmly! If you don't do this, the hot liquid, the vibration, and the steam will force the lid off -- be careful! This looks delicious! I love the color! I enjoy any peppery soups, they have a unique flavor to it. The color of the soup is so vibrant, love it. Hey, I love any dish which looks like we slaved over but happens in minutes..Thanks for a nice recipe. Shawn would love this one. I adore all the robust flavors to welcome fall! An intoxicating dinner recipe! What a gorgeous soup! 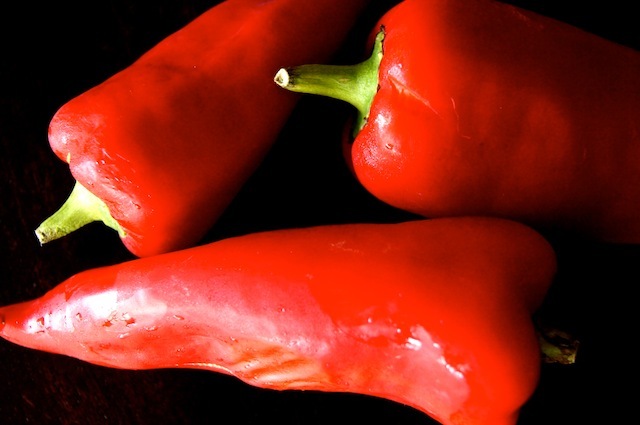 I love the flavor of sweet red peppers – and this is so healthy, too.